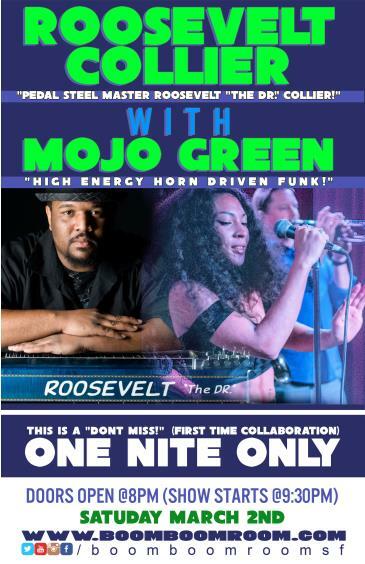 ROOSEVELT COLLIER is joining this bill with MOJO GREEN for a rare and exceptional "first time ever" collaboration as these powerhouse musicians perform the whole night together as one band. In the pantheon of bands who have chiseledtheir name in BooM BooM RooM show greats, this one is at the top of the list. 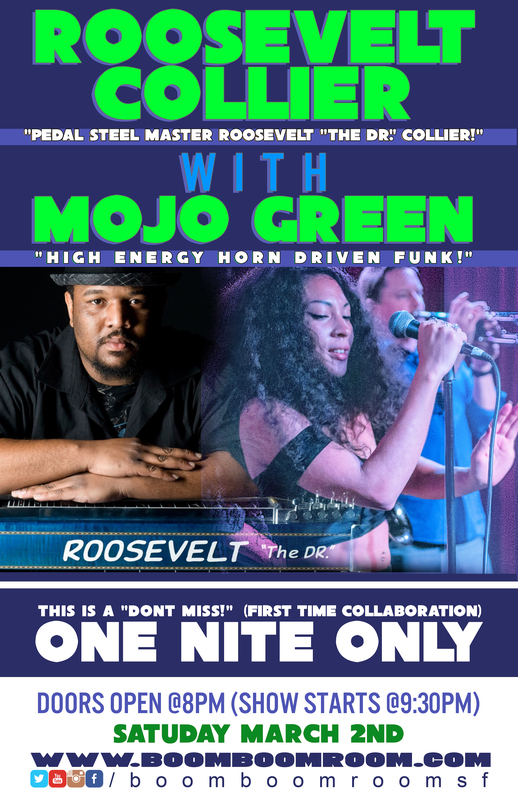 Sacredpedal steel guitarist/vocalist Roosevelt Collier is one of the most highlyrespected musicians on the scene today. He has shared the stage with a who'swho of greats including The Meters, Allman Brothers Band, Tedeschi Trucks Band,Government Mule, Widespread Panic, Karl Denson, String Cheese Incident,Umphrey's McGee and many more. Forming a super group in the most accurate sense of the term, he will be accompanied by MOJO GREEN. Expect a relentless onslaught of spine-tingling jam-rock, blues, soul and funk. The skyis truly the limit with this mind-melting, soul-combusting lineup.